Anna Kottkamp, an environmental science major from Wenatchee, Washington, has been named valedictorian of the 2015 University of Notre Dame graduating class and will present the valedictory address during the University Commencement Ceremony on Sunday, May 17 at Notre Dame Stadium. 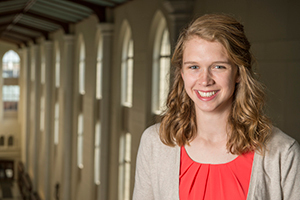 A member of the Glynn Family Honors Program and Phi Beta Kappa Honor Society, Kottkamp has achieved Dean’s List honors each semester and has earned a 4.00 cumulative grade point average. Kottkamp, who has a minor in international development studies, was awarded an Undergraduate Research Opportunity Program grant and traveled to Bolivia in the summer of 2014 to conduct a case study on an organization that works with small-scale farmers in the highlands of Bolivia. She also earned an Experiencing the World Fellowship from the Kellogg Institute for International Studies for an internship during the summer of 2013 in Peru where she worked on various projects, including the design of an environmental education curriculum. As an undergraduate research assistant for Jennifer Tank, Ludmilla F., Stephen J., and Robert T. Galla Professor of Biological Sciences, Kottkamp worked as part of a research team on a watershed scale study about the impact of cover crops on agricultural streams. Her original work has been accepted for presentation at the annual conference for the Society of Freshwater Sciences in June. Kottkamp is also a member of the varsity women’s rowing team. She began her career as a walk-on student-athlete with no previous competitive rowing experience and went on to earn a full athletic scholarship. She was selected for the Rosenthal Leadership Academy within the athletics department and was named an NCAA Elite 89 award winner, Atlantic Coast Conference Scholar-Athlete of the Year, Collegiate Rowing Coaches Association National Scholar-Athlete and ACC postgraduate scholarship recipient. While at Notre Dame, she also performed as a member of the University’s Voices of Faith gospel choir and volunteered with several South Bend nonprofit organizations including the Catholic Worker House and Monroe Park grocery store co-op, where she served as board member. After graduation, she plans to pursue postgraduate service with the Jesuit Volunteer Corps Northwest in Hood River, Oregon, working at the Columbia Gorge Ecology Institute in educational programming for fifth-graders. She intends to later enroll in an environmental science graduate program. The Commencement invocation will be offered by Brendan Bell, a political science major from Havertown, Pennsylvania, who has a 3.98 cumulative grade point average. Bell has achieved Dean’s List honors each semester and is a member of Phi Beta Kappa Honor Society and Pi Sigma Alpha political science honors society and is a Tocqueville Fellow. Last summer, he worked as a research intern at the American Enterprise Institute for Public Policy Research in Washington, D.C. In the spring of 2014, he participated in the study abroad program at John Cabot University in Rome. 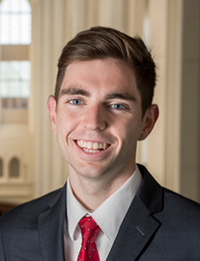 During the summer of 2013, he worked as a foreign policy intern in the office of Irish Sen. Mark Daly in Dublin and also served as a legislative intern in the Washington, D.C., office of U.S. Sen. Bob Casey Jr.
Bell, who has a minor in philosophy, politics, and economics (PPE), recently completed his senior thesis on the relationship between education and social capital. On campus, he was a resident assistant in Duncan Hall, an associate editor for the Notre Dame Beyond Politics Journal and staff writer for the Observer student newspaper. After graduation, Bell will join the Notre Dame Alliance for Catholic Education (ACE) program to pursue a master of education degree and teach high school social studies at Cristo Rey High School in Sacramento, California.